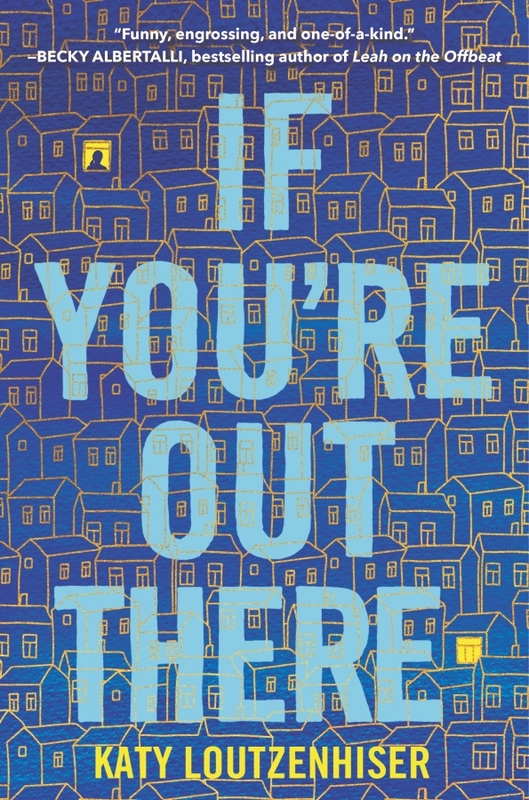 Today we're excited to chat with Katy Loutzenhiser author of If You're Out There. Read on for more about Katy, an interview, plus an giveaway! Katy Loutzenhiser is a graduate of Bowdoin who studied screenwriting and improv with Chicago’s prestigious Second City Training Center. You Out There, inspired by real-life events, is her first novel. She lives in Brooklyn. Meet If You're Out There! This book, while not a true story, came from a very true place. Like a lot of people, I've had my share of friendship heartbreaks. One in particular took me by surprise. The friend and I were living far apart, but MISS YOUs and LOVE YOUs still peppered our epic email chain. Then one day, the messages stopped. No explanation; I just never heard from her again. It was really sad and strange, but eventually I had to let it go. Still, the whole bizarre situation left me wondering: What if this had been someone I’d been more certain of? Because there are people in my life who, if they ever stopped talking to me, I would have to assume were trapped under a boulder. I honestly got a little obsessed with this thought. What would it take to give up on a person like that—a trapped-under-a-boulder person? If You’re Out There was my attempt at answering that question. I’ve had several people ask me this, and the answer changes every time! Writing characters is my favorite part of the process, and I definitely have a special fondness for my secondary players, who may not show up for long but tend to bring the comedy, and exist as fully fleshed out people in my mind. That said, my main character, Zan, is probably still my favorite. She took me the longest to figure out, because she is full of contradictions: crotchety but bighearted, fiercely loyal but averse to showing vulnerability, self-deprecating and funny but incredibly serious when it comes to the things that matter to her. In a lot of ways, she is the me I wish I’d been as a teen. I admire how brave she becomes over the course of the story. And she’s a reflection of the company she keeps, so that just makes me love the ensemble around her even more. The novel, by far. The title actually changed several times. I am terrible at titles. Pretty much everything I’ve ever written has been called some variation of “??? ?” in Microsoft Word. I think the most important thing I’ve learned is to listen to instincts and trust the process. I can’t tell you how many times I found myself writing scenes “just because” only to find them prompting some huge development in the mystery. Maybe this makes me sound like some kind of “open your mind, man” hippie (I am a former comedic improviser, so I guess that’s not far off), but I think the subconscious mind is often slightly ahead of us, and we’re just trying to catch up! Obviously, writing a book takes a ton of planning and critical thought, but sometimes giving yourself over to those seemingly random whims can produce your most treasured scenes of all. I love how deceptively simple the cover is. The artist, Philip Pascuzzo, managed to convey so much in this really contained, elegant form. The pattern of houses behind the title gives off the sensation of feelings small in a big world. And the two lit-up windows, far apart, give us that pang associated with distance, and longing. Also, if you look closely, one window has a silhouette in it, while the other doesn’t. It begs the question: Is she out there? I’m still baffled by how perfect it is. Right now I am eagerly awaiting The Opposite of Always by Justin A. Reynolds and Hot Dog Girl by Jennifer Dugan (I cheated and went twice). I hear both are amazing, and I adore the covers! As someone currently drafting her second book, revising sounds like a dream. So I’m going to say revising. (Though, when I’m revising again, I’ll probably say drafting. My answer here is only partially credible.) The most satisfying thing about going deep into revisions is that mind meld that starts to happen between author and editor. It’s a super cool process, and it’s such a high when you finally pull something off and think, Man, she just made me look good! Hmm. I’d say I’m a pretty keen observer, and I tend to pick up on the dynamics in a room (sometimes even when I wish I didn’t). I was actually relieved when I read somewhere that “highly sensitive” is a thing. I was like, “Whoa, that’s me. I am that!” I’m basically a feelings sponge, always translating the subtext of a moment. But I suppose it helps the writing. Also, I’m a tough person to be secretive around, so you might as well just tell me. This book sounds so interesting! And I like the cover! This books sounds like it's going to be a cute read. Love the cover and the synopsis sounds great! The cover really portrays the isolation of the characters. I like the premise of this mystery. I seriously need this book. I love a good mystery. I love the cover. The synopsis sounds suspenseful and full of exciting mystery and friendship.